The signature cruise of the Bay! Enjoy traveling on a cruise with reduced numbers which allows for better dolphin viewing, better photograph opportunities and of course comfort to move around. The tour includes an extended island stop where Explore customers get to enjoy 100% access to island facilities(Restaurant, Kayaks, SUP’s Conservation Centre etc). We also include a BBQ lunch in the tour, we have lots of viewing decks and complimentary free tickets should you wish to hop off at Russell at the end of the cruise. 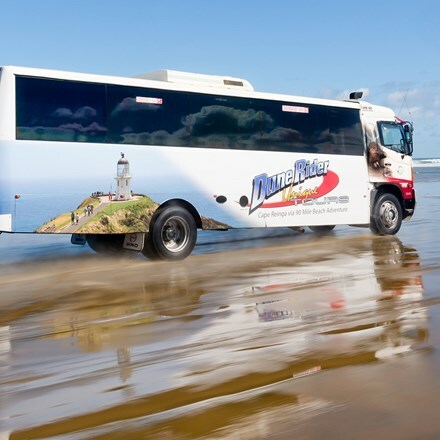 Explore a full day tour in our uniquely designed luxury Dune Rider vehicles. The most comfortable way to see the Far Norths local cultures, historic areas, and ever changing landscapes. Enjoy a buffet lunch at WaiTiki. Visit Cape Reinga where the top of New Zealand meets the Tasman Sea & the Pacific Ocean. Travel down the Patiki Stream, visit the giant sand dunes with the sandboarding experience! This is fun for all and comes with many great laughs. Enjoy traveling down 90-mile beach with a stop to dip your feet into the waters of the Tasman Sea, keep an eye out for the wild horses of Aupouri Forest running alongside the beach. Visit the Ancient Kauri Kingdom and climb the stair case carved inside a 45,000-year-old swamp kauri to the art gallery upstairs. Finally, enjoy fresh fish and chips at Mangonui’s world famous fish N chip shop (own cost). Discover the Bay + Dune Rider + Free Ferry Ticket (collected on-board). 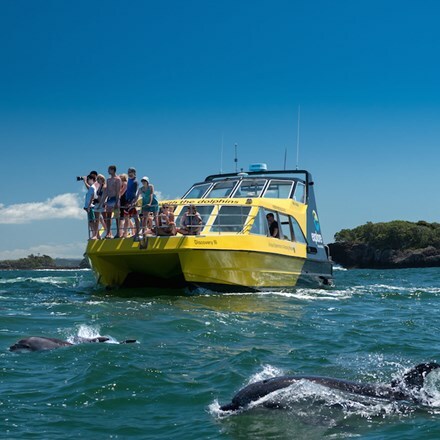 Dolphin Discovery + Dune Rider + Free Ferry Ticket (collected on-board). Enjoy traveling out through the islands to the Hole in the Rock, should conditions permit you may travel through the hole. Enjoy commentary from your experienced captain and crew on the local flora and fauna. This cruise also allows you the option to stay on the Urupukapuka Island and explore the wildlife and beauty of these protected islands. Just let the crew know once you’ve departed the wharf or in the notes of your booking. This product is great from families, those traveling on a budget and those on limited time in the Bay of Islands.